Researchers from this FOM programme have, for the first time, demonstrated the presence of quantum effects in nanowires of iridium atoms. These effects appear to ensure that the nanowires are nearly always a multiple of 4.8 nanometres long. Quantum effects normally only occur at extremely low temperatures , but in these nanowires they even occur at room temperature. 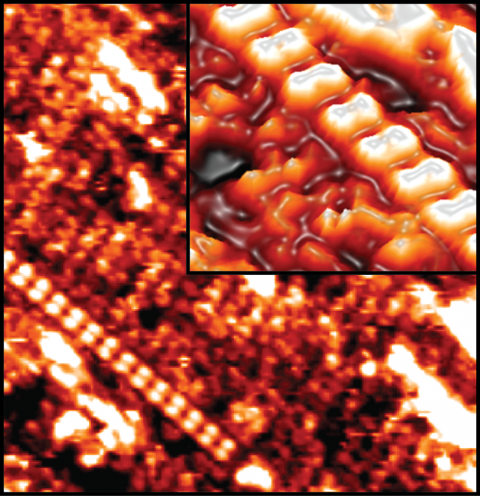 The metallic nanowires, which are two atoms wide and several atoms long, exhibit unique physical properties thanks to their one-dimensional character. Many of these properties are due to the fact that electron-electron interactions in one dimension play a far more important role than in two or three dimensions. The nanowires were grown on a semiconductor crystal by means of molecular beam epitaxy. That they even exhibit quantum effects at room temperature is surprising. Quantum effects appear to electronically stabilise the wires. This only happens if the wire is exactly that long that half of the wavelength of the conduction electrons fits in the wire, or a multiple thereof. In that case a standing electron wave pattern in the wires is found that maintains the wire. This happens when the wire is exactly six or a multiple of six iridium atoms long. The latter is equivalent to a wire length of 4.8 nanometres (or a multiple thereof). Using a scanning tunnel microscope, the researchers imaged the spatial variations in the electron density with subatomic accuracy. Their suspicions proved to be true: a nanowire with a length of 4.8 nanometres exhibits a maximum in electron density exactly in the middle of the wire and two minima at both ends. A nanowire with a length of 9.6 nanometres exhibits two maxima at one-quarter and three-quarters of the wire length and a node in the middle of the nanowire. The researchers published these results in the journal Nature Communications. The figures show the standing waves of the conduction electrons in the iridium nanowires. In the nanowire of 4.8 nanometres (left) exactly a half wavelength fits. In the other wire of 9.6 nanometres (right) an entire wavelength fits. At the top, scanning tunnel microscopy images Â of the nanowires are displayed. The left wire is six atoms long and the right wire is twelve atoms long. The iridium nanowires on a germanium surface.